Daughter of Independence is the life story of Wenny Achdiat: her childhood during the Indonesian revolution and early years of the Republic and her adult years in both Indonesia and Australia. Wenny is the daughter of major Indonesian novelist Achdiat Karta Mihardja. Pak Achdiat’s novel Atheis was published in 1949 (the same year that Indonesian independence was achieved), and treated the conflict between traditional society and modern culture in a way that was both deep and startlingly new. During the revolution he worked for the Republican side and the family had to flee to the mountains when the Dutch invaded in an attempt to regain control. From 1961 Pak Achdiat lectured in Indonesian literature and culture at the Australian National University. Wenny’s parents still live in Canberra. Her father turned 99 in March 2010, and has been helping Wenny with information for the book. 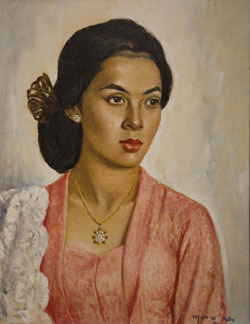 The story covers the dramatic events of the revolution and subsequent life in Jakarta, moving in her father’s circle of writers and artists, including the Presidential Painter, Basuki Abdullah. A theme of the memoir is the conflict between her duty to her parents and her own desire for independence, and how she eventually resolved this. Bryce is writing the book using information provided by Bu Wenny and research into the history of the times. The story is being shaped by the themes of her life, more like a memoir than an autobiography. Projected publication date is 2013. 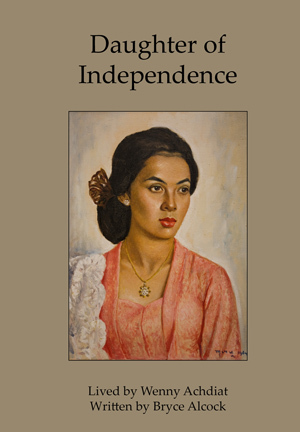 NOTE: Daughter of Independence was published in 2013. To purchase the book, check the sidebar on the right of this blog. For more information, click on Daughter of Independence.